Pianos, and the business of working with them. 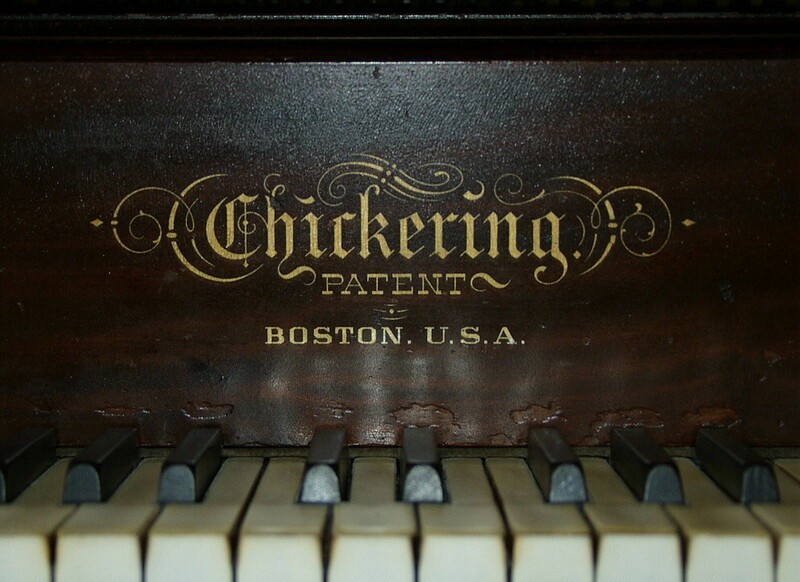 This venerable Chickering upright was built in Boston around 1895, a year before George Chickering died. George had dragged his heels on making the effort to modernize his production, but this upright seems on a par with its contemporaries. This is a classic cabinet grand, big, handsome, and still going strong. Either you will think this is very cool, or you won't. You can't knock Wurlitzer for not trying different styles! This spinet was built in 1939 in DeKalb, Illinois, a mere four years after the console revolution, and it shows just how quickly some manufacturers caught on to that spirit of revolution. The parts of the case where wood can be seen are made of cherry, stained brown rather than the usual red. The rest of the case is covered in cream-colored vinyl, lightly stippled, which has darkened over time. The keybed emerges like an appendage from the dominant vertical box, making the legs almost unnecessary. The angled front, which serves as a music desk, is actually part of the lid, which is not hinged - after unscrewing, one simply lifts it off. 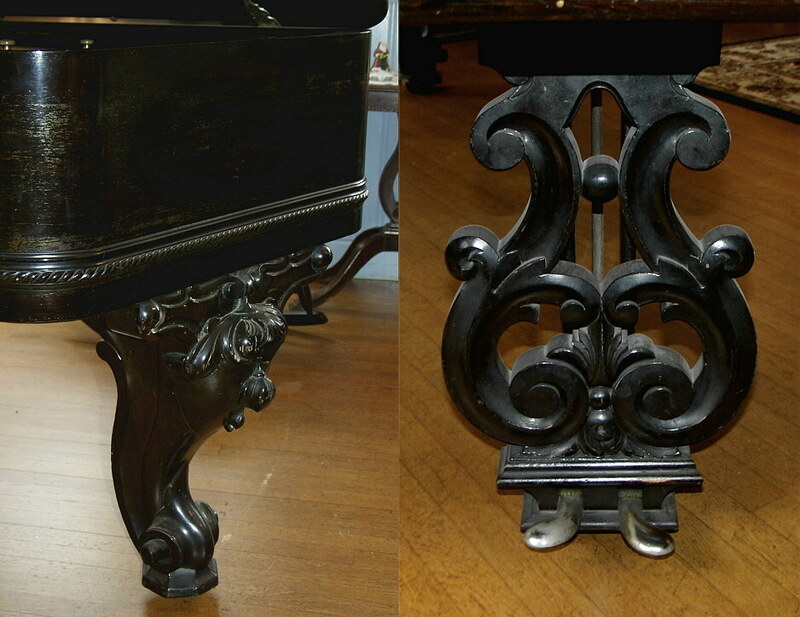 My favorite parts are the roll-top fallboard, the faux lyre, and the decorative brass-plated ferrules at the top of the legs. 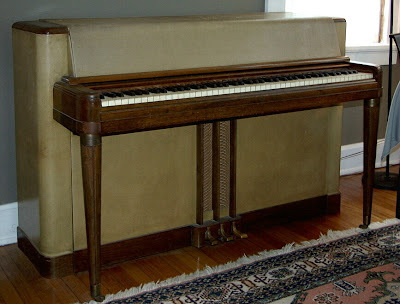 Compare this Wurlitzer to the one I wrote about earlier. A short history of the Wurlitzer Company. 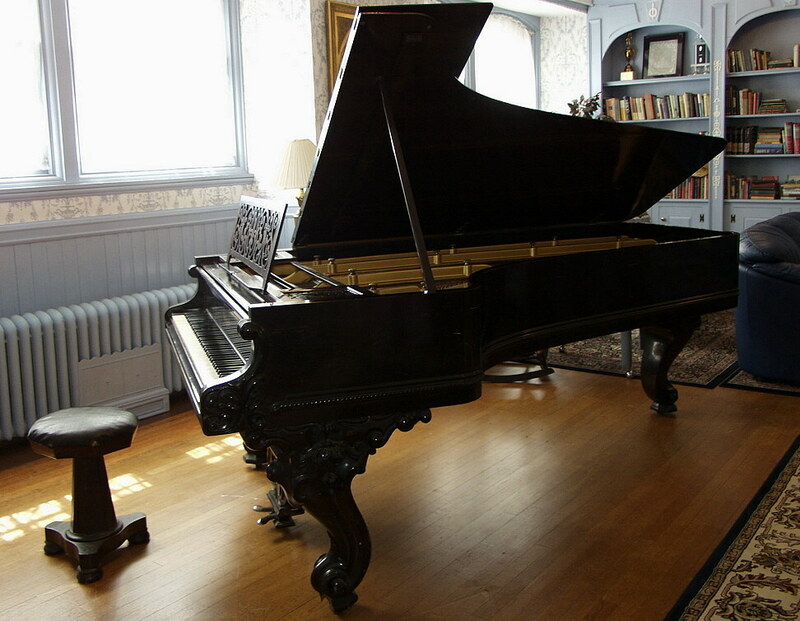 This Chickering concert grand (8' 8") from 1878 belongs to a church that was built in 1852. 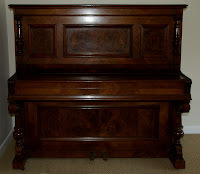 I first saw the piano on its side, stored in a dark alcove with other forgotten items. It had once been the main piano in the sanctuary, but it was considered too old to maintain. At some point, the small space it occupied was needed, and the church was prepared to "get rid" of the piano. A member of the congregation campaigned single-handedly to save the piano, and even bring it back to life. That turned out to be my job, and it was a delight. 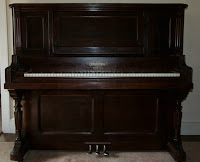 The piano was actually in very good condition, and did not require rebuilding, just repair and reconditioning. It was moved to its current room on the ground floor, and is now getting regular use. 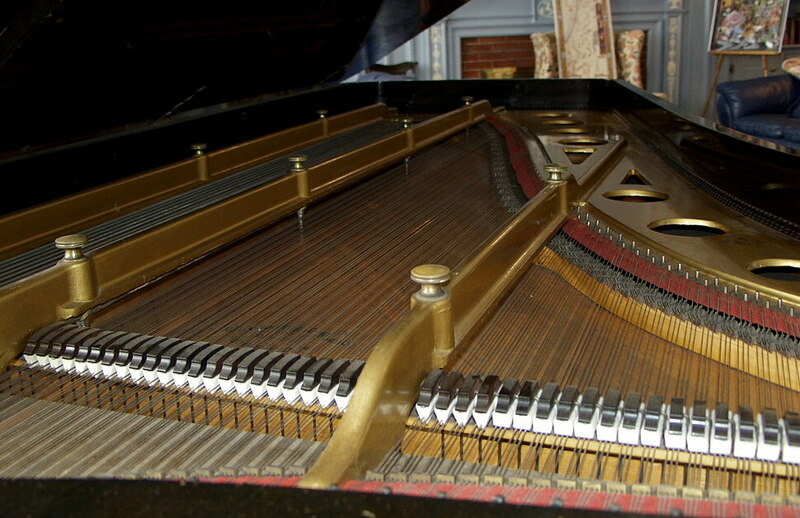 The main feature of this piano is that it is straight-strung. That is, the bass strings do not cross over the treble strings, but run parallel to them instead. The bass strings are iron-wound, and sit on their own bridge. The hammers are also original, as are the ivories and ebonies on the 88 keys. The case veneer is rosewood, pieced together in four sections. The piano's tone is lovely, but clearly not modern. It has little power, but plenty of sustain, except in the upper treble, which is typical for pianos of this age. I suspect it had much more power back when the soundboard was newer. It's very rewarding to play. This poem is from Jane Shore's most recent book, A Yes-or-No Answer: Poems, published in 2008 by Houghton Mifflin Harcourt. was shipped here to my living room. like a notary's raised stamp. stored in his rolling suitcase. above middle C, the piano's axis mundi. while his right hand strikes the keys. sealed with crackled yellow glue. Its sender, now, has passed on, too. When I lost my father, I lost music. but I wouldn't play a single note. Duet for Church Bells and Piano, opus 1. This is one of my all-time favorite spinet designs. The Wurlitzer company, originally based in Cincinnati, Ohio, made a zillion different console models, many of them quite imaginative. 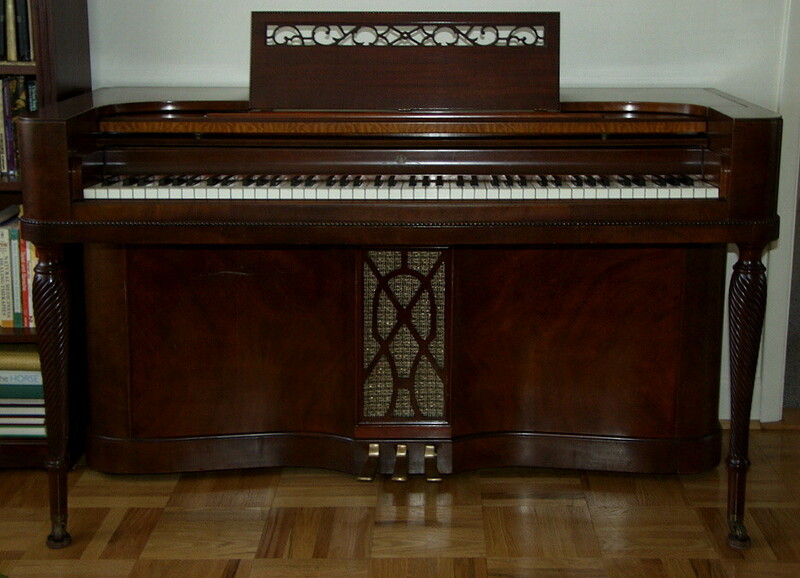 Wurlitzer was one of the handful of companies that immediately embraced the new console design concept when it was introduced in the United States in 1935. This piano was built in DeKalb, Illinois, in about 1943, just as Wurlitzer stopped production during World War II. As with the Krakauer spinet I wrote about earlier, this design emphasizes the square grand shape, but in a more stylized way. The vertical box holding the plate and strings is given some shape rather than being hidden, and the fake lyre is just a decorative gesture. 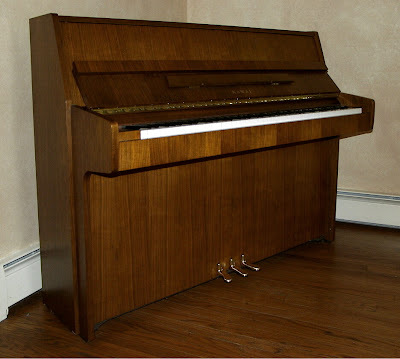 The fallboard is a Wurlitzer classic - it slides out flat over the keys, with the knobs facing up, and then the hinged front swings down to complete the closure. The veneer is basic mahogany, and I love that light horizontal band of veneer above the keyboard. It is also mahogany, the veneer quarter-cut to emphasize the vertical grain, and lightly stained to contrast with the case. All the furniture details are delightful - the band of beading around the keybed, the filigree on the music desk, and, oh, those legs! One thing I love about my appointment book is that I don't have to remember what I'm doing next. I just look in the book to see what's next. My wife is always asking me, "So where are you going tomorrow?" I always cheerfully reply, "I have no idea, it's written in the book." One morning, after consulting my book, I prepared myself for the day and headed off. I was going to be tuning first at the home of a loyal and regular customer with a somewhat common name - let's just call him Smith. I arrived at Smith's house and rang the bell. A man answered the door, and I recognized him as a neighbor I had once met. I explained that I was there to tune the piano, and he explained that he was babysitting until Mr Smith came home. Smith hadn't said anything about my arrival, but the sitter let me in, and I started work. About halfway throught the tuning, Mr Smith came home. He was happy to see me, but confused. "Not that it's a problem, but I thought you were coming tomorrow," he said. I assured him that the appointment was for today - it was in my book, after all. I checked the book just to be sure, and to my horror I saw that my customer was right. So where was I supposed to be? At the home of a different Smith! I also write the town next to the customer's name in my book, and I had failed to register the difference between today's Smith and tomorrow's. I had seen the name, I knew where he lived, and had driven there. Mr Smith was quite gracious - if I had to leave and come back tomorrow, that would be fine. I called Mrs Smith, who had been waiting patiently for me in the other town, and apologized. I explained what had happened, and she thought it was pretty funny. Not to worry, it was OK with her that I come tomorrow, she said. I thanked her, hung up, and finished Mr Smith's piano. Writing information down is one thing, remembering to read it carefully is another! I don't get to see very many of these - a Grotrian-Steinweg upright, built in Braunschweig, Germany, in 1927. This upright came here not too long ago from England. 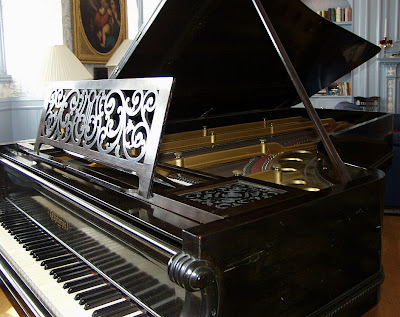 It is in very good condition, beautiful ivories on the keys, a nice mahogany veneer with a quite dark red stain - it is almost black, like a really dark rosewood. It has 85 notes. The tone of this upright is distinct. 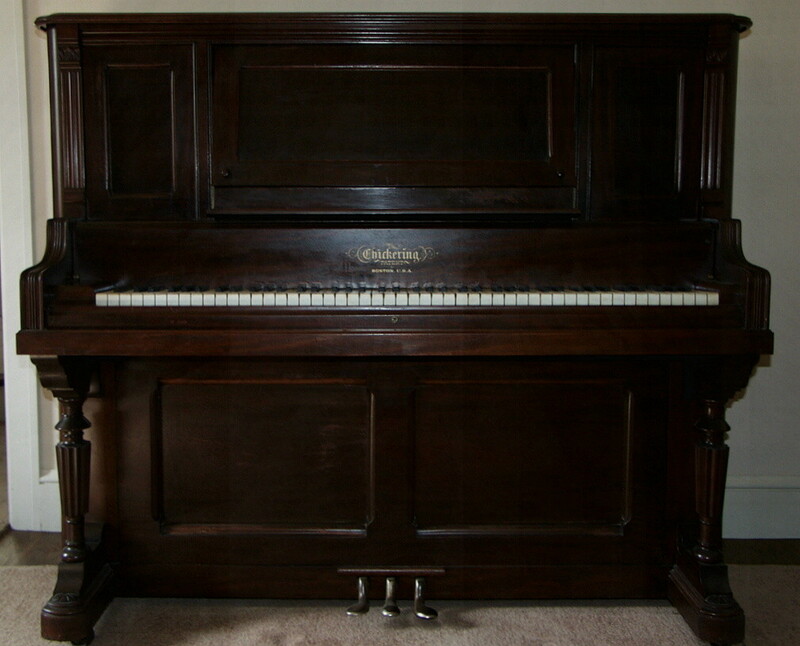 It has a nasal quality, but little of the higher frequencies associated with American pianos. The soundboard has flattened, so there is little power, and the tone tends toward dark and lush. If the name after Grotrian seems familiar, that's no coincidence. Heinrich Steinweg, a German piano maker, came to New York and established a company under his Americanized name, Henry Steinway. With him were three sons, hence Steinway and Sons. But another son named Theodore stayed in Germany and continued making pianos there under the original name Steinweg (pronounced "SHTINE-vaygh"), in partnership with Friedrich Grotrian. Two of Henry's sons died in 1865, so Theodore came to New York to help his father. Theodore was an amazing piano designer, and he ended up being responsible for many of the Steinway patents that helped the company become what it is today. Theodore sold his company in Germany to three of his employees, including Wilhelm Grotrian, son of the late Friedrich. They were allowed to continue using Theodore's name for ten years. After that, the company started using the brand name Grotrian-Steinweg, and that's when the trouble started. The lawsuits began in Germany, and ended up in the United States, and were fought off and on for a century. It was eventually decided by the US courts in 1975 that Grotrian's use of the Steinweg name was a trademark violation, so now Grotrian makes pianos for export to the United States under the single name Grotrian. They are quite lovely pianos, and are still being made in Braunschweig (which is sometimes rendered in English as Brunswick). For more on the century of litigation, see Grotrian vs. Steinway. By the way, Grotrian has a cute musical game on their website called the Pianolina. 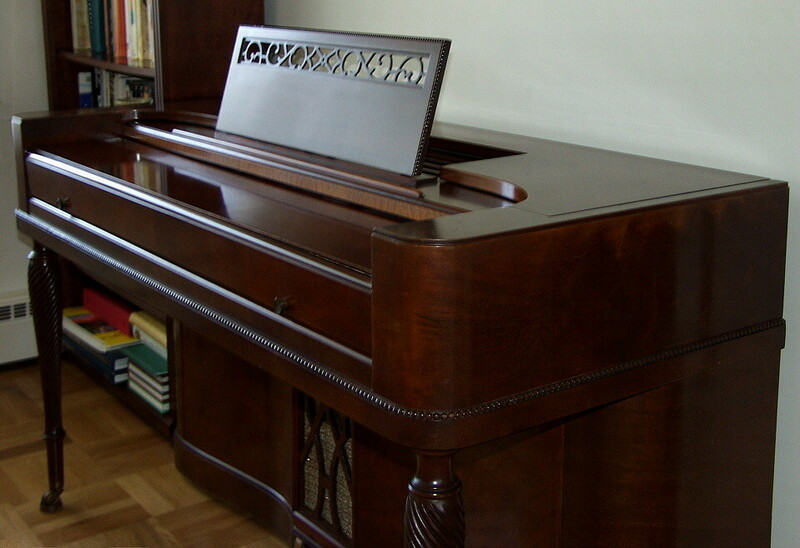 This beautiful Bachmann upright was built in Berlin, Germany. I can't seem to find any reference to this company anywhere, so I can't say for sure when it was built, even though I know the serial number. It was probably built in the very early 20th century. I looked all over the piano for a date. Sometimes whoever worked on the keyboard will sign their names with a date on the first few keys. I've even seen the signature of a manufacturer and a date proudly written on the inside of the case. A hammerhead might carry a date, or the plate might have a date cast into it. If the piano has been worked on by someone who knows when it was built, he might pencil the date on the plate, or on the keyframe behind the keyslip, or stamp it into some wooden case part. In addition to serial numbers, there are also case numbers, used as reference in the factory before the serial number has been assigned. If the action was made by a separate action maker, it could have its own serial number, or a date stamp. Rebuilders sometimes switch parts from different pianos, creating great uncertainty about when a piano was actually built. On this piano I found various numbers, but no date, alas. Bachmann's name is carved into the veneer of the fallboard, something I'd never seen done before. Usually the maker's name is attached as a decal, or sometimes inlaid. 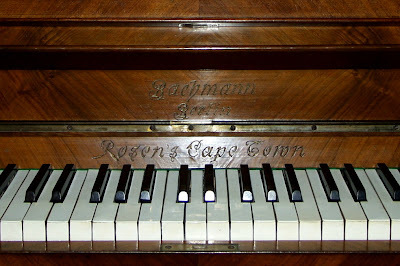 Another name is carved into the keystop rail, beneath Bachmann's name; Rosen's, apparently a piano dealer in Cape Town, South Africa. It is a typical German upright with a bird-cage action (like the Berlin-made Waldmann I posted about earlier, also from South Africa), and an over-strung bass section. The keytops were probably originally ivory, but they have been replaced with ivorine. The gorgeous veneer is book-matched walnut, with burled walnut panels. There used to be candelabra attached to the two side panels in front. The turned balls and collars on the legs are a nice touch. The middle-of-August heat wave finally convinced us swamp Yankees to turn on our air conditioners. For our pianos, it was too little too late. The heat wave was humid, but not as bad as in June and July. * The difference was that June and July were cool, so no one turned on the AC. Now the pitch on most pianos, even those with humidity control, is quite high, but not evenly so across the keyboard. Most pianos right now are almost comically out of tune. If you can wait, they'll actually sound better later in the season (if it's not too wet an autumn). If you can't wait, and you certainly cannot if you're gearing up for the return to school, your tuner will have a lot of work ahead of him or her. Expect the pitch to be 15 cents or more high right in the temperament octave. I'd recommend dropping the pitch to about 6 cents high (A441.5). If you have to go to A440, plan on a pitch-lowering before tuning. The pitch might not be quite so high below the temperament octave. The top of the bass section will be about 5 cents high, rising to maybe 10 cents high around C2, then dropping back down, possibly to zero, at C1. On the treble end, the pitch will actually drop as you approach the tenor/treble break. C5 will be about 5 cents or so high. But don't be fooled, right after the break, you'll be back at 15 cents high. Then the pitch will quickly drop to about 10 cents high or less around C6, where it might stay, or might drop slowly to zero by C8. You'll have to keep alert about octave 4 and the part of octave 5 above the break - the pitch is going to want to drift up as you're working. Keep your wits about you if you want to be done in a reasonable amount of time. Every piano I've tuned recently has been a struggle. Good luck. *A quick example: today is a comfortable 70 degrees F with about a 60 degree dewpoint, cloudy with rain approaching. This translates into a relative humidity of 70 percent, which is quite high in spite of how comfortable it feels. If the temperature hit 90, even with a higher dewpoint of 70 (which would feel pretty muggy), that would only be a relative humidity of 50 percent. Click here for an explanation of humidity (from my website). Click here for weather calculators at the National Weather Service website. I love this little Kawai console, with its vertical plain-stripe walnut veneer. The furniture style, called "continental," features no front legs, flat sides, a large, broad bottom board, and a plain front board that angles back to a narrow top. The lid is hinged in back. It would be more traditional to have only two pedals, but the American market demands three. It was built by Kawai in Japan in 1983. 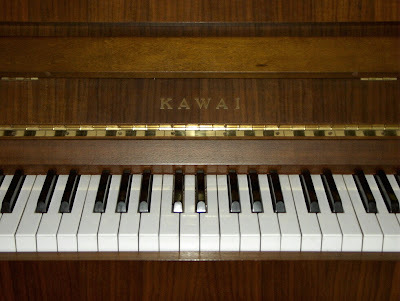 This console model was a very successful model for Kawai, and it is a lovely little instrument. I had never seen one of these with this kind of veneer before. 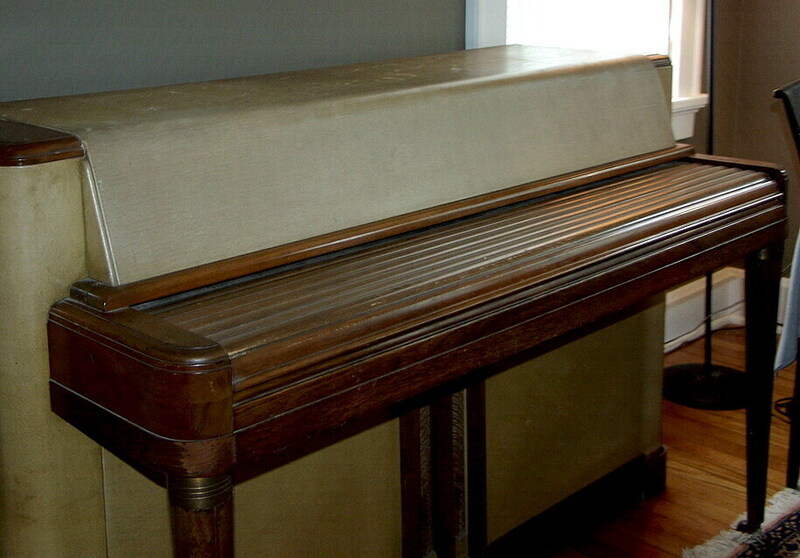 Usually vertical stripe veneer is used as an accent on small horizontal elements, not across the entire piano. It is not everyone's cup of tea, but I think it works adorably with the style. The stripes come from how the wood is cut to make the veneer. The cut is called a quarter cut (or the wood is said to be quarter-sawn), which means that the cut is 90 degrees to the grain, along or parallel to the tree's radius. You can see that it takes five pieces to cover the width of the piano. There is a lovely, romantic fantasy everyone seems to have about playing the piano outdoors. The power of this fantasy may lie in the near impossibility of achieving it, given the half-ton-or-so weight of a piano. Or perhaps the Romantic-era piano music we are all so familiar with inspires visions of mountains, forests, and seas. Countless CD covers and posters have featured grand pianos on the beach, in the woods, on mountaintops. 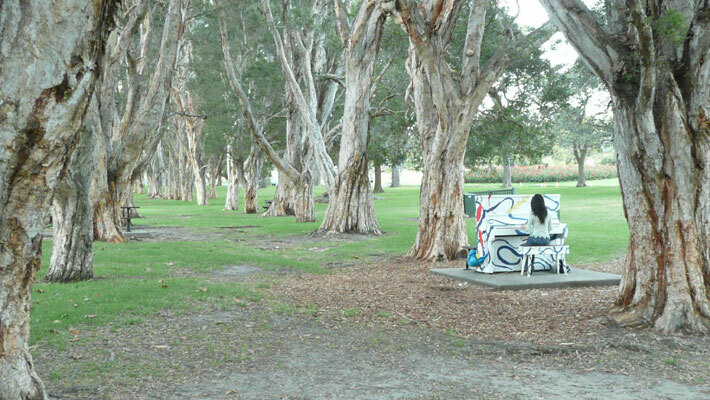 Good luck bringing this fantasy to life, though - nature is not kind to pianos. One common approach is to have a room especially dedicated as a piano room, with big picture windows facing out onto your favorite natural vista. If this is your dream, I have a couple of suggestions. It is pretty important to have both the room's temperature and humidity controlled so the piano is not destroyed. You will want to play in your shirtsleeves in the middle of a moonlit snowfall, for instance, or play to the setting sun with a cool sea-breeze blowing through. You will be ecstatic, but your piano will be unhappy. Direct sunlight is particularly bad. If you can't bear to have curtains and shades blocking the sun, then you need to treat the windows to lower the amount of radiation coming in and baking your piano. Your soundboard will crack within a few years no matter what you do, and the piano will never stay in tune. It may be worth it to you, though. 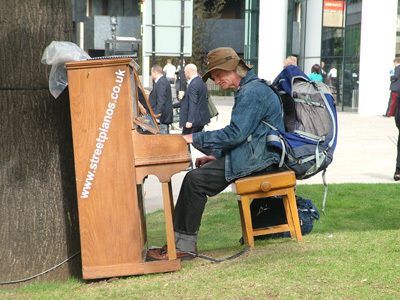 Another approach is to have a small, nearly portable piano that you can carry around with you. I knew of a guy who had one of those 69-note minipianos that he kept in a van. If he were camping at a music festival, he could wheel the piano down a ramp and join in on a jam session out in the woods or on the beach. Portable electronic keyboards present a similar, though much less romantic, possibility; you can get a small solid-state generator to provide the electricity (or bring a really long extension cord). I have seen old upright pianos living on porches, somewhat protected from the elements, slowly rotting and falling apart, but available for outdoor playing until it's no longer possible. Here is one of my favorite news stories, from CNN in November of 2008. Someone apparently left a piano in the woods of Cape Cod, in the middle of conservation land in Harwich MA, just before Thanksgiving. It had not been there long, so it had suffered no ill effects, but no one knows where it came from or how it got there. The police were called, and they rescued it, you might say, but no one claimed it. I hope somebody besides the squirrels got to enjoy playing it under the trees. Here's another approach: this pianist, named Yosuke Yamashita, has performed a couple of times on a grand piano outdoors, but with a twist. 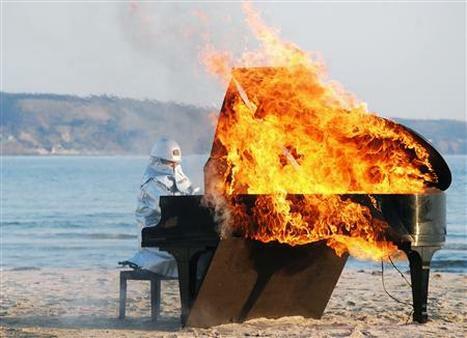 The piano is set on fire first before he plays it, and then he plays for as long as he can. Here's one video. I don't know if he lets the tide take the carcass out to sea, like a dead whale, but that would seem appropriate. Now to the actual point of this post, which is the work of an English artist named Luke Jerram. Among his installations is a project he calls Play Me, I'm Yours. 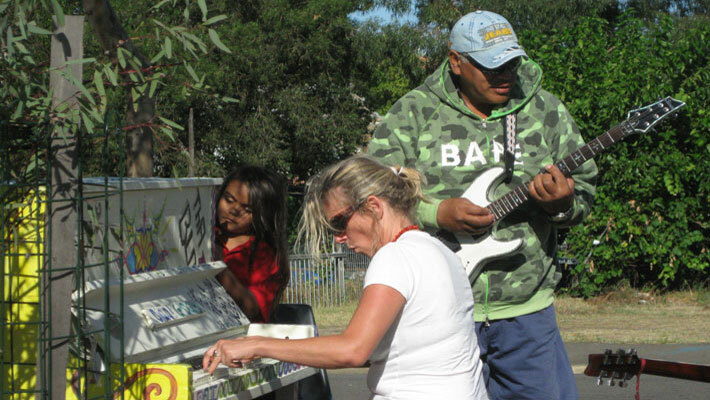 For a limited time, he places pianos in public outdoor spaces in a city, and passersby are encouraged to tickle those ivories. The pianos are later donated to organizations in the city. He has done this in Sydney, Australia, São Paolo, Brazil, and most recently, London, England, where thirty uprights, decorated by artists, were placed. 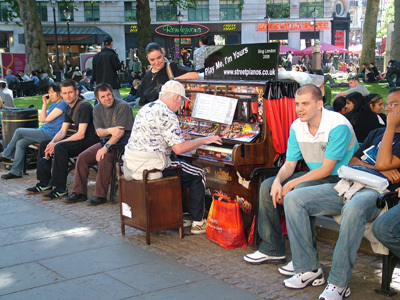 I love the idea of the outdoor urban piano. It is much more social than the idyllic, solitary reverie with nature most people imagine with outdoor pianos. Jerram outfitted each piano in London with a book of music, the pages laminated, so people could gather around the piano and sing along. Quite often crowds would gather when the pianos were played. Two or three people might share a piano. Other musicians would appear with their instruments. Jerram noted that he was surprised by how many people knew how to play at least a little bit, and felt free to do so in public. Jerram doesn't say much about how the project is put together. Judging from the photos, some of the pianos look pretty old - they're apparently donations and cast-offs. The website for the London show credits a piano-moving company, but I wondered if the pianos get repaired and tuned. Then I read a NYT article, which said a "piano tuner who travels around on a bicycle, providing on-the-spot help, has had to bring in reinforcements to deal with all the wear and tear." Aw, brings a tear to my eye! You can see that the pianos and benches are secured and locked in place. One picture shows a plastic sheet pushed aside, so I guess they get protected this way from the rain. 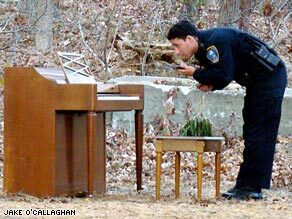 I also read about pianos in parks getting locked up at closing time, so maybe there's a group of volunteers who tend to the pianos each day. Here is the New York Times article about the London event. Here are a few more photos from the artist. This lovely grand was built in Baltimore, Maryland, in about 1890. 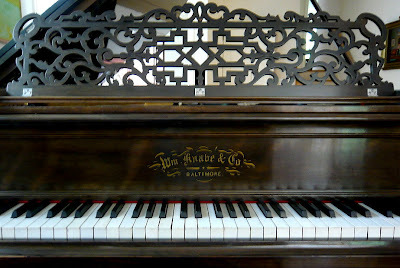 Knabe (pronounced "k-NAH-bay") was one of America's premier makers, and after the Civil War was considered on a par with Steinway, Chickering, Mason & Hamlin, and Weber. This piano was made when the company was still run by a Knabe; Ernest, the son of the founder William. Knabe figured prominently in the formation of the American Piano Company in 1908. George Foster, a business school grad, had started out as a reed organ salesman, and by 1894, the year Ernest Knabe died, had formed a partnership with William Armstrong to manufacture pianos in Rochester NY. Their first major acquisition was the Marshall & Wendell Co of Albany in 1898. 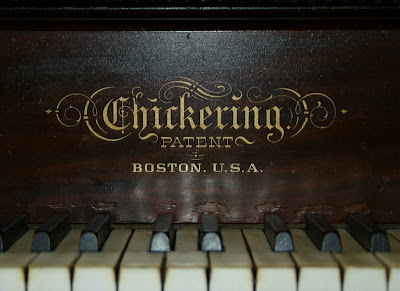 Finally, a decade later, after acquiring a number of other companies, they incorporated as American Piano Co. Knabe was one of the cornerstones of the company; Chickering & Sons, bought in the same year, was the other. 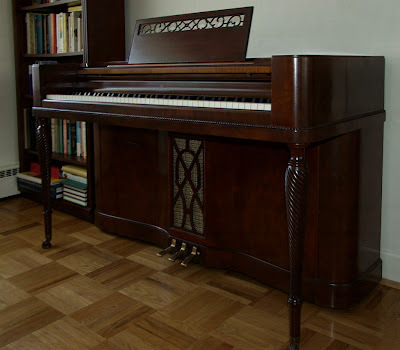 But long before those events, this 7½ foot walnut-veneered grand rolled out of the factory in Baltimore, as would many more until about 1930, when Knabe was moved to the American Piano Company's factory campus in East Rochester. Pianos with the Knabe name continued to be made in East Rochester for another 50 years. After a hiatus of passing through various owners, a Knabe line was developed and manufactured in Korea in the late 90's, and finally bought by the Korean maker Samick in 2001. Samick continues to manufacture pianos with the Knabe name. 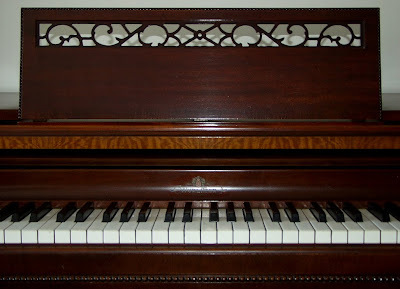 A few details about the instrument: it has 88 notes, two bridges, a pieced (rather than molded) case, and a sloped pinblock not covered by the plate. 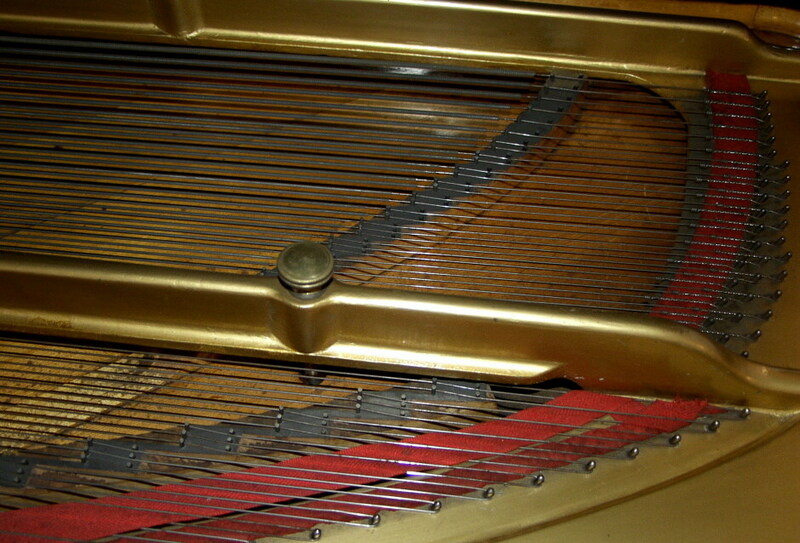 The action has wooden brackets, and uses a wooden rocker mechanism rather than the modern threaded brass capstan to regulate the connection between the keys and the wippens. It has a surprisingly modern tone for a 120-year-old piano.